In my previous post I wrote of the inspiration I gained from H.W. 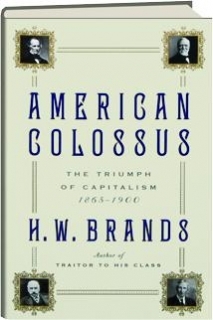 Brands’ book American Colossus: The Triumph of Capitalism 1865-1900; specifically how Brands discussion of the dueling natures of capitalism and democracy could lead to a solid classroom discussion in an 11th grade US History course. This post is regarding another aspect of Brands’ thesis, something that Brands calls the ascendancy cycle in American history. What follows is far from a polished lesson, but instead the beginnings of an idea that hopefully will result in something beneficial for my students. In the book, Brands claims that the competition between the forces of pure capitalism and pure democracy can be used to characterize the last 200 years of American history. This competition has resulted in the proponents of each of these founding principles consolidating power, furthering their beliefs, losing that power to the opposing group as they create policy furthering their agenda, so on and so forth. I believe that looking at US history through this lens provides students a concrete example of the ebbs and flows of American politics and how these elections can fundamentally alter the course of the nation. Too often in history courses we cut and divide history into neat chunks with a starting point and ending point. (I am admittedly horrible at this and am attempting to make a concerted effort this year to improve.) We teach “The Gilded Age”, “Progressivism”, “The Roaring 20s” and on and on it goes. Sometimes the overarching story of the evolution of American society can be lost during the specific examination of a smaller time period. This thought, combined with Brands’ book, felt like it could lead to something valuable for my students. Yet it was the memory of a lesson from my college days that helped that “teachable moment” crystallize. As an undergrad at KU I took a class on American political parties taught by Dr. Allan Cigler. During the semester Cigler explained the realities of American politics in a way that sparked an interest in political theory that has yet to subside. However, one specific concept that has stuck with me is regarding the theory of political equilibrium. Basically, this theory is rooted in the concept that neither Republicans nor Democrats can effectively govern for too long of a time period, and that the whims of the American people will surely shift to the side out of power. This cycle continues perpetually, and the result can be seen in the Presidential elections of the last 100+ years. That lesson in the early spring of 2008 came rushing back to the forefront of my mind as I read Brands’ work. I hope that I can take this concept of political theory and combine it with Brands thoughts to create a concrete example for my kids. 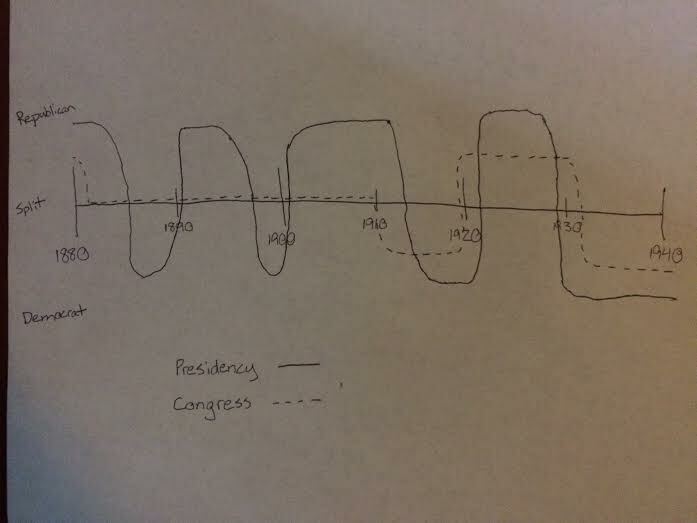 The endgame that I hope to achieve is for students to be assigned a specific chunk of this timeline to study. Their task will be to identify how the government’s interaction/involvement with business and the economy has shifted over time (Example: laissez-faire economics of the late 1800s, TR’s anti-trust movement, pro-business policies of the Coolidge/Hoover administration, the New Deal, etc.) Hopefully they will see how the political cycle has continually shifted, and that the policies enacted by the brokers in power have fundamentally changed the status quo of the American economy. Each subsequent generation of power is left shifting the new status quo closer to their desired goals; pure capitalist versus pure democracy to use Brands’ terms.